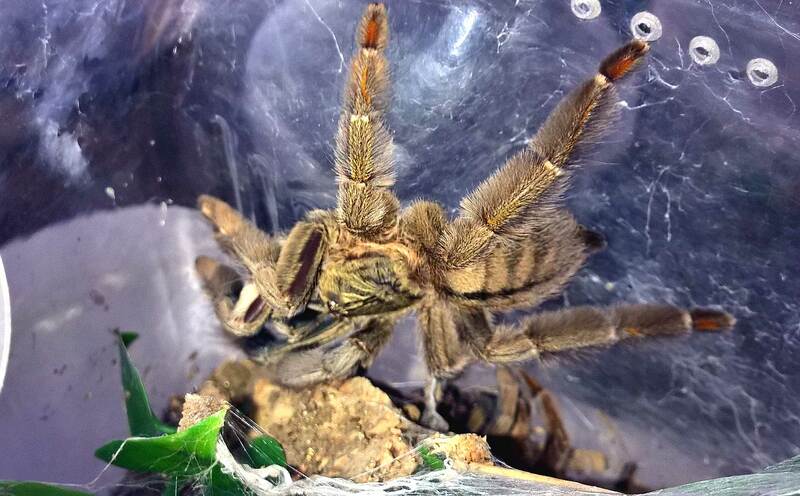 When I first got heavy into the hobby, I was immediately attracted to tarantulas from the genus Poecilotheria. As a result, I skipped some of the “stepping stone” arboreal species that keepers usually start out with to prepare for these advanced Old World spiders. For years, most of the aboreals in my collection (with the exception of two Avicularia) were from this genus. As I acquired more and more pokies, I tended to ignore some of the other amazing arboreal tarantulas available in the hobby. It wasn’t until very recently that I decided it was high time I tried out some of the other genera of tree-dwelling tarantulas; namely Psalmopoeus and Tapinauchenius. As luck would have it, an order from Pet Center USA earned me a free P. cambridgei, or “Trinidad Chevron” sling, kicking off a newfound appreciation for these awesome spiders. When I first received my P. cambridgei in early October 2015, it was about 1″ or so. I housed it in 32 oz deli container ventilated with three rings of holes around the top. I added about 3″ of moist substrate (a combination of topsoil and vermiculite), a piece of cork bark flat with plastic leaves hot glued to it, some sphagnum moss, and a small bottle cap for a water dish. As a sling, I kept part of the substrate moist (not wet) at all times. To do this, I would pour some water down one of the sides, allowing it to percolate through the substrate down to bottom. This kept the lower levels moist while the top dried out a bit. I also tried to keep the water bowl full at all times, although she would often web it up or fill it with substrate. As with all of my tarantulas, the temperatures ranged from 70-75° in the wintertime, and 75-80° during the hot summer months. Even when the temps were a bit cooler, this T was still very active and continued to eat well. As a sling, my cambridgei burrowed a bit into the substrate and webbed up behind its cork bark using substrate and sphagnum to make “dirt curtains”. By the time I finally rehoused it, it had webbed up the entire enclosure right to the top. It was very reclusive during this period, quickly bolting into its burrow whenever disturbed. Even as a sling, this spider was very fast, darting out of view in the blink of an eye. TIP: Many folks hear the term “arboreal” and immediately expect their slings to hang up high on the cork bark. However, many arboreal spiderlings will start their lives on the ground, and some will even burrow a bit. If your Psalmopoeus species sling starts digging, rest assured; there is nothing wrong with it. They usually outgrow this behavior once they put on some size. While a sling, I would feed it one small cricket twice a week. As it put on some size, reaching about 3″, I moved up to a large cricket once a week. This spider has been a ravenous eater, taking all prey items down with amazing speed and ferocity. It has been a very fast-growing species, having molted five times in 10 months and putting on an impressive amount of size with each molt. At the time of this writing, it is about 4.5″. In April of 2016, it had outgrown its deli cup, and I rehoused it into a larger enclosure. I used a one-gallon Mainstay clear canister which I ventilated with dozens of holes and hot glued a water dish up in one of the corners. Although I started with the substrate moist, I let it dry out. During the summer months when it is quite humid, I leave it dry and keep the water dish full. In the winter months, when the furnace is running and the air is dry, I moisten it on occasion by pouring a bit of water down the side. As it has webbed quite a bit, I also dribble some water on the webbing when I feed it to give it a choice as to where to drink. TIP: For some fast and feisty species, rehousings can be the source of a lot of anxiety. If ever an escape or bite is going to happen to the careful keeper, this is the time. For fast-growing species, like P. cambridgei, many folks choose to rehouse them into their adult enclosures much earlier than they would with other species. This limits the number of rehousings that the keeper has to perform. When first relocated to this new enclosure, the cambridgei was quite shy, building a web and secreting itself behind the cork. Now that it has settled in, it sits right out in the open most of the time. Unlike some of my other skittish arboreals that will bolt to hide when disturbed, this one will boldly stay put. After its next molt, I’ll be rehousing it into its adult enclosure. As this species can reach 7″, it will be getting an arboreal enclosure roughly 7 gallons or so. The P. cambridgei is a beautiful, fast-growing arboreal species that makes a wonderful showcase spider. That said, they are very fast and many report that their specimens have quite the defensive attitudes. However, this speed and “attitude” make it a great stepping stone species to Poecilotheria without worry of the more potent venom of this Old World genus.